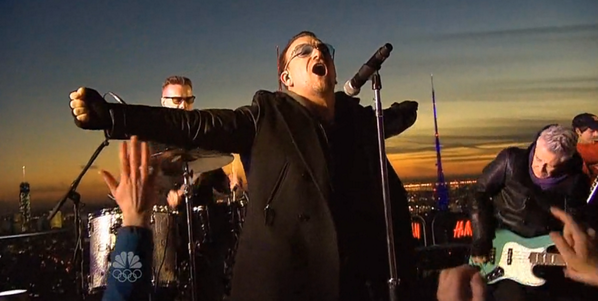 U2 appeared on Jimmy Fallon’s first night hosting The Tonight Show earlier this week. They played “Invisible” on the roof of 30 Rockefeller Center and then performed “Ordinary Love” acoustically in the show’s studio. My favorite moment of the night was a small and very simple gesture that instantiated this reality. Bono, at the end of “Ordinary Love,” calls out Questlove, the drummer for The Roots. Watch how it makes Questlove smile. It’s a beautiful moment of connection and inclusion.